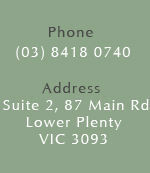 You will readily experience the calm and warming environment of the Lower Plenty Clinic. You will be met and brought through to discuss what health issues you may be having so a unique diagnosis can be made. Initial consultation takes up to 70mins, this allows for highly personalised patient centred care. Overall the treatments are soothing and gentle, inducing a state of relaxation and healing. Daniel and Ellen utilise acupuncture, massage, cupping, moxabustion, and granulated herbal medicines as different methods to achieving positive results with your condition. Is Traditional Chinese Medicine and Massage covered by private health insurance? Yes, most health funds have adopted Acupuncture and Herbal Medicine in their coverage as more consumers have turned to alternative medicine to improve their health. Massage is recognised by all health funds. Seniors and concession discounts available. Cash, Eftpos, Credit Card. Hicaps is also available for on the spots claims with private health insurance. Making an appoinment with Daniel or Ellen can be done online! North Eastern Chinese Medicine is a convenient location to many surrounding suburbs including: Montmorency, Eltham, Viewbank, Heidelberg, Rosanna, Macleod, Greensborough, Watsonia, Doreen, Research, Templestowe, Doncaster, Bulleen and Warrandyte.